African companies are going public at what could be their fastest ever rate. 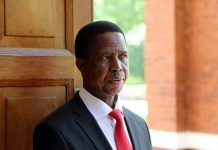 Thirty initial public offerings by African-based companies are already in the pipeline for 2015, according to research by global law firm Baker & McKenzie. 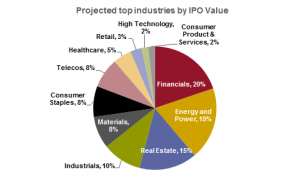 If just the deals announced so far complete, volumes will spike by a quarter from 2014, which itself saw the highest IPO volume since the financial crisis. There were 24 IPOs by African domiciled companies in 2014, a 33 per cent rise in volume and a 222 per cent increase in value from 2013, raising a total of more than $2bn. 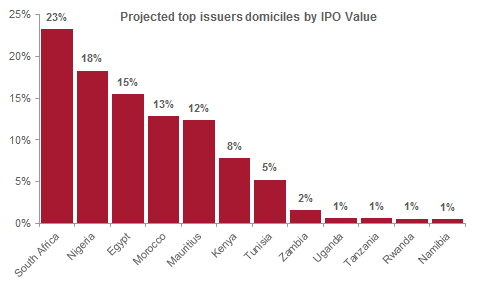 For 2015 in sub-Saharan Africa, South Africa, Nigeria and Kenya are the countries with the projected highest IPO value, partly driven by the exit strategies of private equity investors who snapped up assets in the wake of the financial crisis. Mauritius is also a popular destination for structuring deals. In North Africa, Egypt is set to be the most prominent issuer as the economy recovers from four years of turmoil, making long-delayed deals viable, with activity also in Morocco and Tunisia. Significantly, financials and real estate are likely to be the most active sectors, along with more well-established areas of activity such as energy and power. African companies are still most likely to go public on their domestic exchanges, with the Egyptian, Kenyan, Moroccan, Nigerian, South African and Tunisian markets set to be the most active in 2015. But more deals will be cross-border. Listings by African-based companies are currently planned in London and Frankfurt, and more are likely to emerge in the course of the year. Six cross-border IPOs are in the pipeline compared to one completed in 2014 (Seplat) – potentially a five-fold increase. The climate for cross-border deals within Africa is improving too. The East African Securities Regulatory Authorities have set June 2015 as the deadline to harmonize capital markets laws in Kenya, Uganda, Tanzania, Rwanda and Burundi. • December 4, 2014 – Ethiopia becomes the latest nation to issue a sovereign bond, with a heavily oversubscribed $1 billion sale. -December 17 – oil services company Atlas Development & Support Services becomes the first from the UK’s AIM market to gain a full listing on the Nairobi Securities Exchange, raising $5 million from Kenyan investors. • December 18 – Johannesburg Stock Exchange sets a new record for intraday equity trading volumes, hitting R53.7 billion (US$4.6 billion), 41 per cent higher than the previous record, set in 2012. • December 19 – Angola inaugurates its much-delayed debt and securities exchange, with an equity trading market planned for 2016.